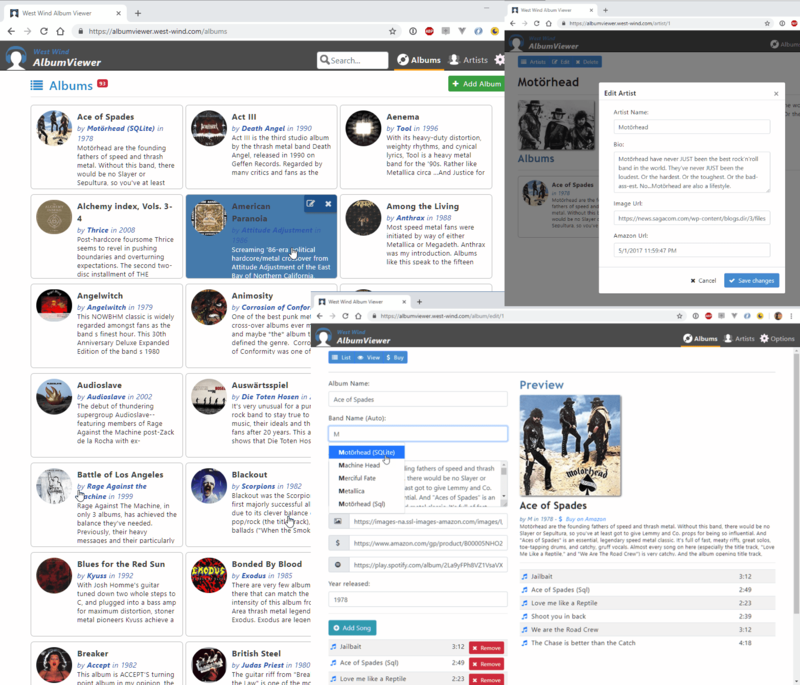 I've been keeping my old AlbumViewer ASP.NET Core and Angular sample application up to date, and today I decided to take a little time to update the application to the latest ASP.NET Core 2.1 RC and Angular 6.0 bits. The good news is that the ASP.NET Core update was completely painless. Updating Angular from version 5.2 to 6.0 on the other hand took quite a bit more work because Angular has introduced a new way to deal with rxJs which pretty much affects all observables in the application. Additionally, i ran into a weird WebPack/Angular CLI build issue that was causing a last minute painpoint when trying to upload the application. If you want to play with this stuff, the sample and all code is up on Github. Until ASP.NET Core 2.1 releases the code lives on a NETCORE21 branch in Github - I'll move the code over Master when the final build of Core 2.1 is out. Final release is supposed to come out by the end of the month as was announced at Build yesterday. Updating to .NET Core 2.1 from 2.0 was pretty much a no-brainer. Essentially the whole process involved installing the new .NET Core SDK and updating package references. There were no code changes required over the two updates I did for the preview and then to RC. 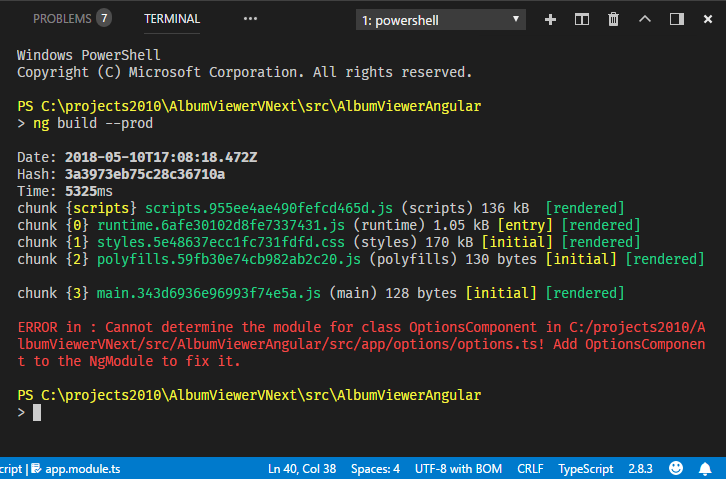 For this small project package updates basically involve going into the NuGet Package Manager for both projects and looking for out of date packages. The main update is the AspNetCore. Note that there's no explicit version specifier required as I'm using the latest version, but essentially this uses the same 2.10-rc1-final version. There's no direct option to configure the .NET Standard version, rather it's determined by the SDK and build tools. Apparently they are very confident there in the backwards compatibility. ASP.NET Core 2.1 includes a new configuration option that lets you opt in for bleeding edge changes - changes that might break behavior in some edge cases. The services.AddCompatibilityVersion() allows you to opt in to changes that might opt backwards compatbility and you can specify either a specific version that you're willing to go with or Latest. There's practically nothing there anymore. This is an API project so there are literally no additional features needed, but you obviously need to add things that your app requires like CORS and the appropriate Authentication mode(s). It's really nice to see lean startup class to begin with. Notice also that the default project now automatically adds HTTPS support and enables HSTS (all requests out of content have to be HTTPS) in production. The app.UseHttpsRedirection() middleware is a nice enhancement too - one less thing you have to remember to set explicitly. The other change related to this this that 2.1 apps now automatically launch both HTTP and HTTPS Urls on port 5000 and 5001 respectively and the debugger now launches into the HTTPS version. 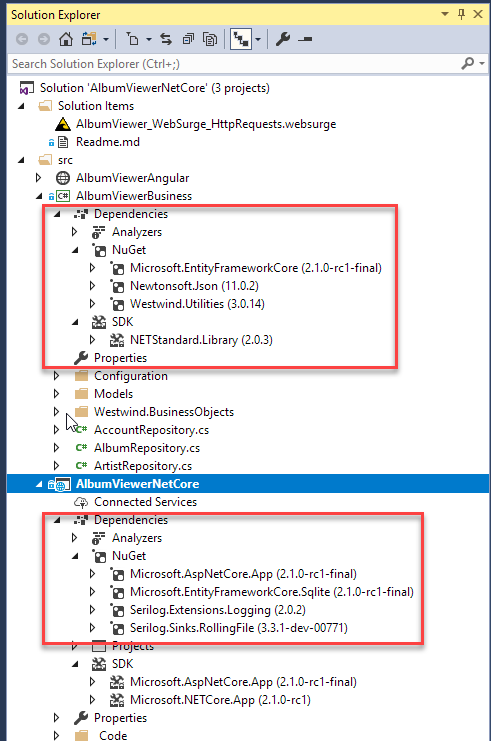 One very welcome change in .NET Core 2.1 is that you no longer have to explicitly add development time build tools for dotnet watch, User Secrets or the Entity Framework console commands as these are now built-in and always available. In testing out .NET Core 2.1 on a couple of additional projects that are quite a bit larger than my sample here, the big thing that stands out is that build performance is much improved at least on Windows. Build speed now seems to be at least on par with full framework, and maybe even a little better. Even full rebuilds which were horribly slow before are now working much faster. Yay! Angular is keeping to bi-yearly release schedule and we're now up to Angular 6. The upgrades from version 2 all the way up to 5 have been largely uneventful when it comes to upgrades. Most updates were simply a matter of upgrading all the dependencies. It's been while since I'd done updates so I actually did a two step update process this time around. I was running a late 4.x version, and initially jumped straight to 6.0 before it was released. However, that did not go well... Because it wasn't released yet upgrade information was a bit spotty and I didn't realize that there were going to be major changes in Angular 6.0 that would end up breaking my application rather hard. After spending a couple of hours fighting and not finding decent docs to point me in the right direction I decided to wait until 6.0 was released. Which - in true Mr. Murphy fashion - happened the day **after I rolled back to 5.2. Argh. So the upgrade from 4.x to 5.24 was very quick. Moving to 6.0 took a bit longer, but after 6.0 was released there was actually decent documentation. One of the big new features in Angular 6.0 is support for ng update in the Angular CLI. ng update updates the angular-cli configuration angular.json and package.json files to bring up the core Angular and Angular dev time dependencies. This worked reasonably well for me but not before I made a few funky mistakes I hope I can help you avoid. package-lock.json was the one that got me - I did everything else, but because I didn't delete the package-lock.json file at just the right time I ended up restoring the wrong versions. It took me a few go-arounds to make sure that the final npm install was pulling all the right files. Probably the biggest change you need to deal with in Angular 6.0 is the changeover to rxJS 6.0. Recall that rxJS is used for the Observable objects you use for any kind of event handling or HTTP processing. rxJS has always been a funky implementation and has undergone many changes in how it's referenced - the access APIs keep changing. rsJS introduces yet another backwards incompatible change that requires making syntax changes. That's all that you need - this package basically provides the same structure as the old rxjs syntax did and then provides shims to the new functionality. The angular folks have mentioned that rsjx-compat is a temporary fix and that you should try and move your code to the new syntax. The other option is to go through your project and explicitly update to the new syntax. The former is a big deal and addresses one of the major beefs I've had with this library in that it was always very difficult to figure out exactly what you needed to import and the imports were basically undiscoverable. The new import syntax just has a couple of high level module paths to import from and once imported Code Completion/Intellisense can help with finding the right operators. Imports have been simplified and typically come only from rxjs or rx/operators. The core components like Observable and Subject and some core operations like of are found in the rxjs namespace. All operators can now be retrieved from rxjs/operators no longer do you have to have individual imports for each operator. Yay! In previous versions you used chained operations to call operators. You'd combine operators like .filter() and .map() to string together Observable operations. In rxJS 6.0 this changes to a parameter based syntax using the .pipe() function. The following is code inside of a service that returns an Observable<Album> for an HTTP call to the caller. The new syntax replaces chainable functions with explict function calls as parameters to the .pipe() function. Now personally I think this is crazy ugly syntax and a big step back, but according to the rxJs team this is supposed to make it much easier for build tools to optimize the actual bits that are pulled from full rxJS library resulting in a much smaller footprint. That said, I can get used to this I suppose, but it still seems like some very odd decisions for a mature library to make to essentially solve a build issue. But alas it is what it is. To migrate to the new syntax is not difficult as you can see when you compare the two versions. You can usually just add the .pipe() function and wrap it around the operators and remove the . and commas. Easy but time consuming. The good news is in Angular the compiler catches all of these if you don't have rxjs-compat installed so the usage is easy to find and fix. In my smallish application this took about 10 minutes, but obviously in a larger app this will take time. and this will try to automatically fix up the imports and change to .pipe() operations or offer them as fixup options in the IDE. I didn't have a chance to try it as my sample app is small but for larger apps this looks very useful. 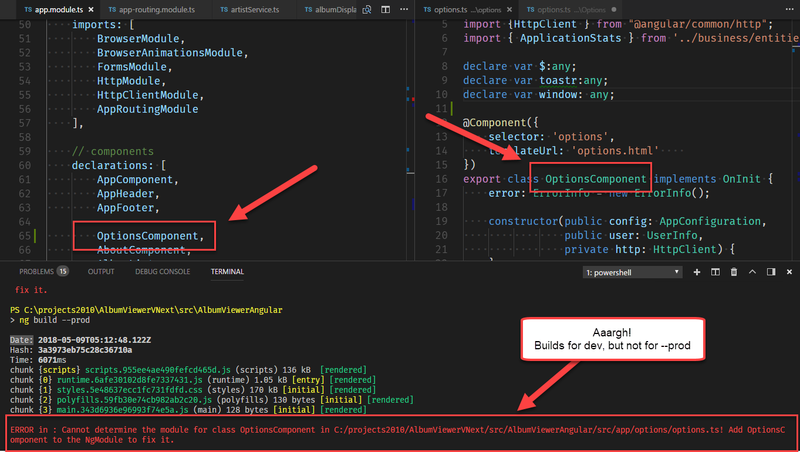 I also ran into a very strange build issue in the Angular project. When I built the project initially and ran it in development mode, the app built and ran fine. No errors. So what the heck is going on here? It works in development but fails in production builds. So it turns out the problem was an import in the module where the path was not the proper case. How did I find this? @MarkPieszak was kind enough to hypothesize that I might have two copies of the options file. Which led me to check all places where the component was referenced and made me then find the invalid path. Found and fixed the path and... Bingo. Code builds! Thanks Mark! Yikes! The path clearly isn't correct here - and the path doesn't exist. It turns out that restarting VS Code fixes this (Phew! otherwise that would just be completely random), but it looks like the name lookup plug-in caches paths once it has resolved them using whatever was entered. Nasty one that one and it took me an hour to track that single build error down. Sigh. In the end the Angular app built properly and ran fine. Other than the rxJs changes there were literally no other code changes required which is nice given that the codebase hasn't been touched since the last major update to Angular 4.0. All in all, this two step update process to .NET Core 2.1 and also Angular 6.0 was relatively painless especially since I had let this app sit idle over a number of update releases. For .NET Core 2.1 the process was a breeze, but the Angular update required a bit of work primarily to deal with the major rxjs changes. For now the code on Github remains on a non-master path (NETCORE21), until .NET Core 2.1 is released to RTM which apparently won't be very long. The runtime should provide more info so we don't have to spelunk around and hack at this. I agree with the above statement: I spend more time investigating and troubleshooting than doing actual work. Every step is extremely painful. @Pepe - for which part? ASP.NET Core or Angular? Angular is another story, but since V4 things have also stabilized. The rxJS changes are dreadful (both in terms of what's required to update and actual implementation details, but hopefully this is a one time thing and I guess they deliberated around this and this syntax will be used going forward for the long term. I have done my upgrade. the only issue I am facing is about the bootstrap css. while browsing I am not getting my css. this is my angular.json in my package I am added "bootstrap": "^4.1.1", when on angular 5 it was working. I am just generated it from .net core 2.1 angular template. would you know why adding this doesn't work? @Ed - Make sure you are on the latest RC. Otherwise you might be missing a namespace reference. @harry - I have to take a look and see. Haven't tested on IE in a long - at this point Internet Explorer is dropping off my list of browsers that I generally support. That said I still think this should work. Looks like in order for IE to work explicit polyfills have to be added. By default these are off in Angular applications.